Can you believe we are a week away from Halloween then next up is Christmas, where has the year gone? I had the pleasure of going along to the Lush store in Braehead last night to have a look at all of the christmassy goodies that Lush are doing this year. Much to the disappointment of myself and a few of the Lush staff, Hot Toddy is no longer being made so isn’t apart of the christmas collection this year. What are your favourites at Christmas? Do you love Hot Toddy as well? I love going to events because it gives you a chance to see all of the bloggers you might not have seen in awhile, Events are not only a great way to find out about certain products and launches but to also make some great friends. I managed to see Charlotte (Colours and Carousels), Lis (Last Years Girl), Laura (A Life With Frills), Lori (Glasgow Beauty Blogger), Ellis (Ellis Tuesday), Amanda (Honey Pop Kisses), Ayden (Little Blog of Horrors), Lynsay (Miss West End Girl). All people who i absolutely love they are just the best people to talk to because they get what you are doing as they are going through the same as you. We all got a chance to make our very own Butterbear Bath Bomb which was so cute! Snuggle up in a vanilla-scented bear hug with softening Fair Trade cocoa butter from the Colombian Peace Community of San José de Apartadó. Creamy and pampering, this polar pal will melt hearts young and old. Butterbear is only available at Christmas but you can find a similar bath bomb called Butterball in the permanent line. We got to see a few of the Bombs Bombs and how they look. I had 2 favourites, Luxury Lush Pud and Intergalactic even though that isn’t Christmassy. Luxury Lush Pud is this pink foamy amazing smelling-ness. Catch 40 winks on Christmas Eve with islands of sleepy foam and comforting lavender. Tonka absolute provides the perfect Christmas dessert for your skin, while the reassuring scent of lavender oil and creamy benzoin resinoid banishes tension and aids relaxation. Soothing for excited children and grown ups alike. For the lovers of all Princess-y goodness out there you will absolutely love this next product called Candy Mountain. Containing fairtrade vanilla that grows in view of the Rwenzori Mountains of the Moon in Western Uganda before being packed into this peak of its own. Crumble the swirled pink summit under running water and embrace glistening ridges of bubbles and comforting creamy candy mist. Charlotte from (Colours and Carousels) absolutely loves this product she says she even wants a perfume made from it as that scent is so good. To top off an already fantastic night we got a little skincare talk from the amazing Dawn, all about what we could use to combat the effects of the the changing weather on our skin. Dawn like me has really dry skin so it was great to get to pick her brain to see what i should be using. She gave me a great recommendation of using one of the Festive Face Masks in the Christmas range called Cranberry which nourishes the skin throughout the winter, this mask is full of antioxidant cranberries and cleansing fennel seed infusion. A blend of argan oil and rose clay leaves skin matte and luxuriously soft. Who needs Christmas pudding when this is waiting in your fridge instead? 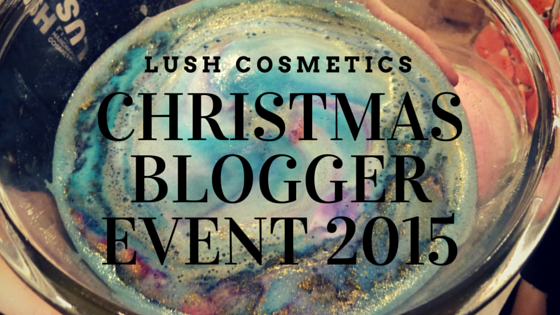 What is your Lush Christmas must have? What is on your christmas list for Lush this year? Have heard about Lush often and seen many outlets too but never tried any of their product yet. Your post was helpful and I can now select something from their store. Do they give any free samples so I can try before buying? This looks like such a fun event and some lovely products! I’ll have to get myself on the Lush blogger list ? Peeping Santa sounds perverted enough, but the description is even more disturbing… it’s a good job he smells so sweet! Also, lol @ me stuffing my face in the background there. I tried the Santa one the other week and it was lovely. It’ll be better once we’re closer to the festive period. ohh dear lush! i should go on the online shop and start making my xmas wish list! need a santa something! Great post! I am a huge Lush fan and even more so at Christmas time! My favourites are Rose Jam, Candy Mountain and Butterbear.